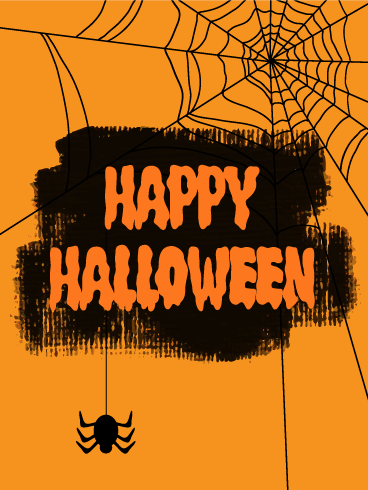 One black spider is hanging around to wish your friends, family, clients or co-workers a Happy Halloween! 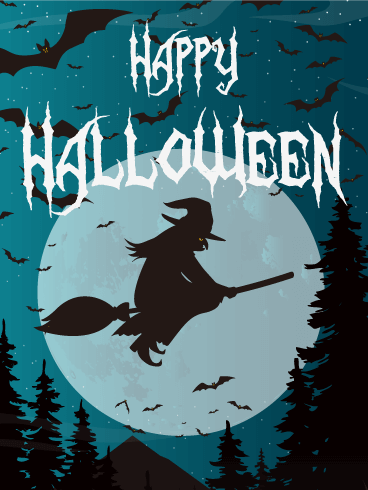 With a simple orange background and lettering that looks like dripping paint, this no-nonsense Halloween card will be appreciated by your friends and family members. You can't go wrong with this adorable ghost popping up to surprise your recipient! 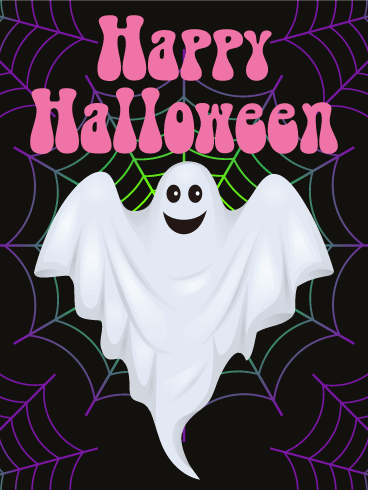 This Halloween card features a white-sheeted ghost with a friendly smile, against the backdrop of a colorful spider web. 70's-style pink lettering completes this whimsical message to share with young and old alike. A lovely black cat with long whiskers and a smiling jack-o-lantern are here to wish your friends and loved ones a Happy Halloween! Bats swoop in front of the large, orange moon to complete the mysterious yet friendly image. 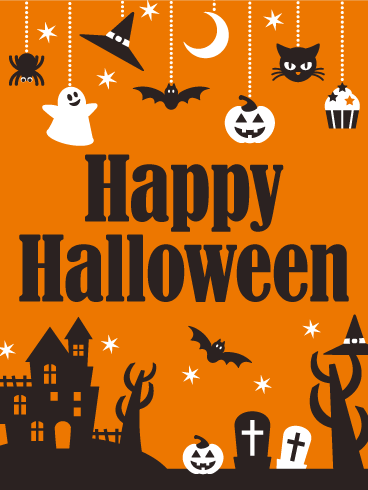 Make someone's day by sending this pretty Halloween card. Two jack-o-lanterns a ghost share a laugh on this fun Halloween card. Spiders drop in to see what the joke's all about! 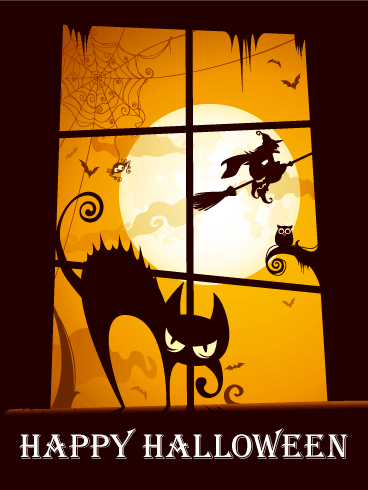 From lemon yellow to deep red, the color palette adds to the drama of this Halloween card. This is a great choice when you're looking for a card to bring a smile to the face of your recipient. 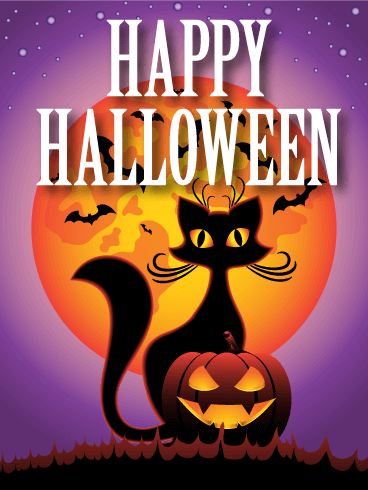 Greet your friends, co-workers, or family this year with this simple yet memorable Halloween card. With the complementary colors of purple and orange, this Halloween card features the silhouette of a cat outlined against an orange Harvest moon in the graphic style of a screen print. 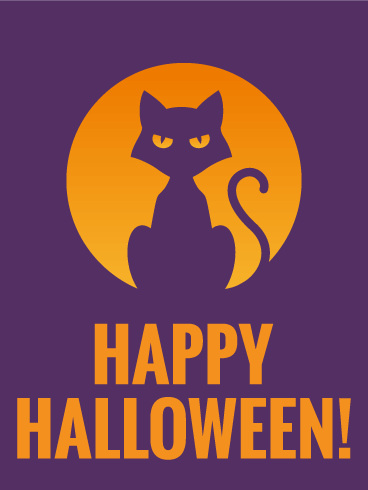 Recipients of this Halloween card will feel chills of delight when this fantastic, eerie kitty pops in to wish them a Happy Halloween! Whoooo's there? 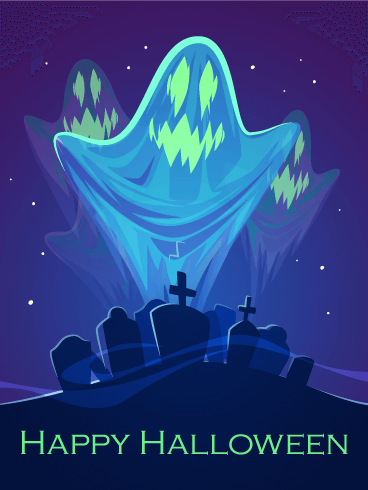 Ghostly phantoms rise up from a graveyard to haunt the neighborhood! Glowing green eyes and teeth appear from beneath their light blue sheets. 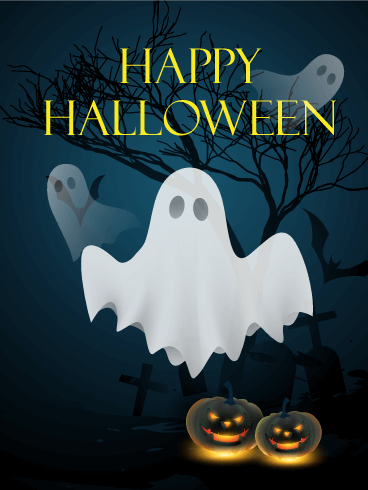 This creepy Halloween card will bring chills of delight to those who enjoy the scarier aspects of this holiday. Make your friends tremble with fear! Wandering the woods at night is terrifying, the trees creak and the wolves' howls creep ever closer. But nothing is more horrifying than to stumble upon a clearing, look up, and see this witch. Her glowing orange eyes and the sound of her flock of bats will be the last thing you know as she takes your soul before - What a nightmare! Send this Halloween card to your friends to laugh about in the light of day. This Halloween card has the vivid look of a lithograph print, as two jack-o-lanterns glow in the foreground while the autumn wind rustles the grass. A black kitty with lovely yellow and green eyes completes the image. 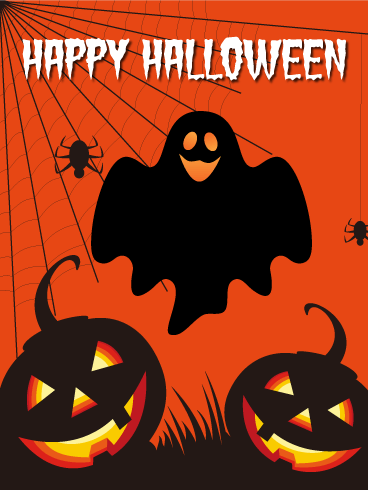 Show your artistic good taste by sending this stunning Halloween card to your friends and loved ones. Prepare for spooks! All the regular guests are getting ready for a visit - carved pumpkins, witches, bats, zombies, ghosts, black cats, spiders, and the mysterious old man who lives on the hill. They may look scary, but Halloween is the only time they can come together and have a fun party. 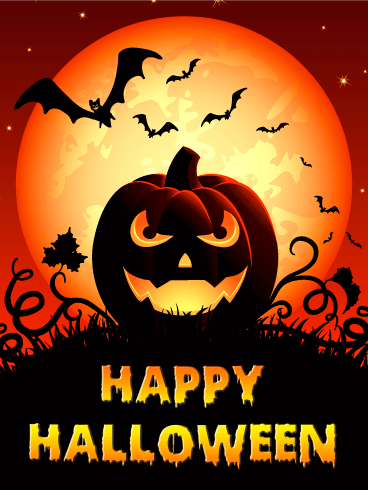 Send all your friends the friendly spirit of Halloween! Celebrate the images of the season with this classy Halloween card. White-sheeted ghosts float in the night sky as two eerie jack-o-lanterns light the way. 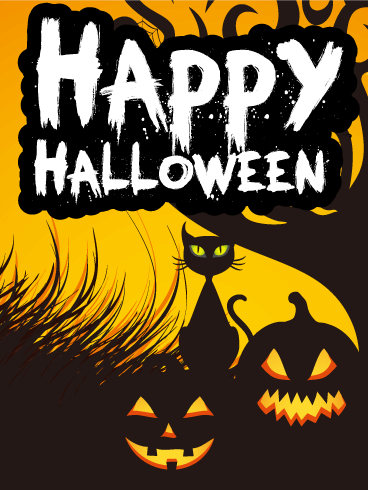 A Happy Halloween message in crisp yellow lettering completes the look of this attractive Halloween card. 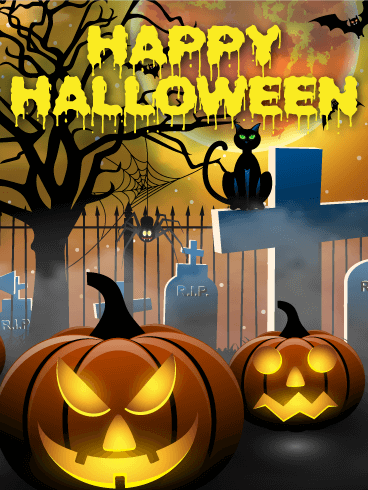 A black cat with glowing green eyes stands guard over a cemetery where two spooky jack-o-lanterns rest, while a creepy black spider drops in to check out the scene. Even the words on the Halloween card drip as if they are melting from fright! This is a Halloween card that will definitely delight those who enjoy the creepier aspects of this holiday.